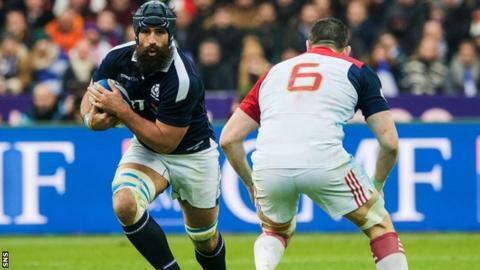 Scotland back-row Josh Strauss will join English side Sale Sharks at the end of the season. Glasgow Warriors opted not to offer the South Africa-born player, 30, a new contract with his current deal expiring at the end of the season. He had attracted interest from top-flight clubs in England and France. But Strauss, who has 10 international caps, will move to Premiership side Sale on what is understood to be a three-year deal. The Manchester club declined to comment when contacted by BBC Scotland. Meanwhile, fly-half Rory Clegg has left Glasgow Warriors for English Championship side Ealing Trailfinders. The 27-year-old has brought his second spell at Scotstoun to a close, having made 16 appearances and scoring 95 points. Strauss is recovering from the kidney injury picked up during Scotland's defeat by France that curtailed his Six Nations Championship. The back-row, who qualified to represent Scotland after completing three years of residence, joined Glasgow in 2012 from the Lions. He has made 104 Warriors appearances, helping them win the 2015 Pro12 title - the club's first silverware. Strauss' ball-carrying was also pivotal to Glasgow reaching a maiden European Champions Cup quarter-final this season. They will meet defending champions Saracens on 2 April.